This tree is best known for its bright autumn foliage and for producing maple syrup. It is also extremely valuable as a timber tree, and has hard wood used for furniture, flooring, trim, and woodenware. It is also a favorite street and garden tree, because it is fast-growing, and easy to propagate and transplant. It is a moderately large tree, often 70â to 80â in height, branching a few feet from the ground to form a large, dense, pyramidal or rounded crown. Leaves are opposite, simple, deciduous, and usually 5-lobed; rich green above, pale and glabrous below. Flowers appear with the leaves in early spring. Dense corymbs are formed from 5-10 flowers on long, hairy, drooping stalks. The fruit is a double samara with thin wings, about 1â long. The bark is light gray and smooth at first, but becomes darker, thicker, and deeply furrowed into long scaly ridges on large trunks. Sugar Maple is most common on moist, rich soils of slopes and ridges, as well as on those of limestone origin. It thrives in well-drained loam, but also tolerates poorer soil, light clay, or sandy soil. It does not, however, tolerate poorly drained areas and is short-lived on flood-prone clay flats. 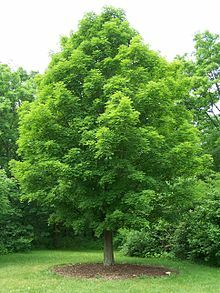 This tree is an important species in the ecology of North American hardwood forests. In the South, it is usually associated with oaks, hickories, yellow poplar, and ashes. Human influences have contributed to the decline of Sugar Maple in some regions. It has a higher susceptibility to pollution than other maples species, and is commonly being replaced by more opportunistic species in areas where forests are cut over. In the Northeast, the increased use of salt for de-icing purposes has contributed to the treeâs decline as an ornamental âstreet-frontâ tree.